Rise in the price of onions has returned to haunt India’s political class. Depending on which part of the country one stays in, the price has increased 20 to 80 per cent between December last year and January. It is not that prices of other vegetables have not increased, but onion’s political charisma is unmatchable. It can instantly turn a government’s fortunes upside down. Onion price rise in 1980 helped Indira Gandhi to topple India’s first non-Congress government. The sweeping nationalism in the aftermath of five nuclear tests of 1998 could not help BJP retain power in Delhi and Rajasthan because of the highest ever onion price rise. Such is its mystical power that in 2010 prime minister Manmohan Singh made a public statement in which he termed onion price rise a “grave concern”. This statement is one of the rare quick responses from a prime minister not known for prompt public articulation on any matter. In the last week of January, Delhi’s chief minister deployed her machinery to control onion price, for elections are just a few months away. Reportedly, the prime minister is being regularly informed on onion price movement as the agriculture minister took a tour of the “onion areas”. Onion is a political equivalent of a terror threat: the system gets into over-drive even at the slightest rise in price. But, why onion? There is no social, economic or political study to explain onion’s strange political affiliation. It is a sort of botanical justice to the vegetable on the origin of which there is no definitive answer. Onion farmers are not a powerful lobby like the wheat or paddy ones, to mean a lot in political terms. The middle class suffers higher price rise in other essentials like milk, but it talks about onion price rise with the same vigour as it would of a popular TV soap. Also, though onion is an essential ingredient in Indian food, mostly political workers use the issue to stoke public anger (yes, people have voted on this in above instances). In fact, price rise in or shortage of other essentials like drinking water hardly lead to such political mobilisation. The more intriguing fact is that despite being so sensitive to political set up, why have we not evolved a mechanism to control price of onion, besides the age-old market control tricks like banning export or fresh imports? Who will have a clue to this? Maybe because it is a staple vegetable, people identify with onion better, cutting across economic lines. In rural areas, a diet of rice and onion is used as an indicator of poverty. That is why during high price rise stand up comedians and protesters sarcastically refer to onion as gold. Or maybe, it is such a lowly vegetable that it emerges as the right indicator of anything wrong with the market. Anyway, in popular perception inflation is always a proxy for economic well-being. Risking the hazard of over-simplifying, the power of onion may be called a hoax that everybody subscribes to blindly because the factors causing price rise of onion and other commodities are same. Going by basic economics, price rise is a direct fallout of the demand and supply imbalance. Onion is not immune to this. And this is where it becomes a victim of political class. Research points out that the usual afflictions which impact agricultural produce also affect the demand and supply chain of onion: lack of transportation, effective distribution network and market distortion. Not to forget the omnipresent middlemen who manipulate prices of all commodities for profits. An investigation by the National Council of Applied Economic Research into the 2010-11 onion price rise found that government protected the wholesalers who had manipulated the price by hoarding. In the current phase, the National Horticulture Development and Research Foundation says the price rise is unusual. This is because till January all the major wholesale markets had near normal arrival of onion stocks. But prices have gone up by 166 per cent compared to last year. This hints at price manipulation in the wholesale markets. What policy makers have done to overall agriculture, they are doing it to onion as well: quick fix solutions for temporary relief. Government stops export, increases imports and mounts raids on traders for hoarding. In the recent onion crisis, government had one solution: increase supply through import or ban export. This reduces the price artificially, but has a long-term disincentive for farmers. They hesitate to take up extensive cultivation knowing they will hardly get the genuine price. That could be the reason onion farmers hardly reap benefits out of such high prices. 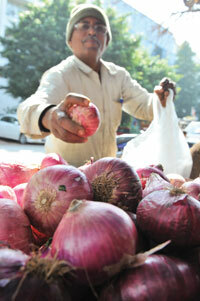 Even now farmers are selling onion at Rs 8-10 per kg. This is anyway a general problem with all agricultural produce. At a time when the era of cheap food is over, the onion price rise loses its usual appeal of hurting the poor. But the myth must be busted to figure out the real problem: political myopia vis-à-vis agriculture. Short term problem is created by traders and government needs to tackle them with short term solutions as in the present case. That is where the political narratives get into the equation. Perhaps Economic Survey 2009-10 Chapter 2.6 will give a better explanation to this frequent tear-jerking malady in India. Lobbying is a factory farm vocabulary inappropriate for a marginal-small farm dominated production landscape. The strategy that s at play in the Indian agriculture is the following: 'PM proposes agriculture ministry disposes'. Look at the national horticultural mission's intervention strategies that has been immaculately conceived in Krishi Bhavan while it was to be the other way round. This has led to burgeoning of the unspent balance and reduction in the ratio of expenditure to allocation. So much for the long- term solution to the Onion crises. Why not we manufacture ONION OIL so that these distortions in Prices can be checked?